St. Scholastica was the twin sister of St. Benedict, the Patriarch of Western monasticism. She was born in Umbria, Italy, about 480. Under Benedict's direction, Scholastica founded a community of nuns near the great Benedictine monastery Monte Cassino. Inspired by Benedict's teaching, his sister devoted her whole life to seeking and serving God. She died in 547 and tradition holds that at her death her soul ascended to heaven in the form of a dove. 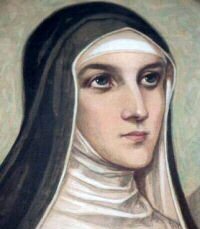 "His sister Scholastica, who had been consecrated to God in early childhood, used to visit with him once a year. On these occasions he would go to meet her in a house belonging to the monastery a short distance from the entrance. For this particular visit he joined her there with a few of his disciples and they spent the whole day singing God's praises and conversing about the spiritual life. "When darkness was setting in they took their meal together and continued their conversation at table until it was quite late. Then the holy nun said to him, 'Please do not leave me tonight, brother. Let us keep on talking about the joys of heaven till morning.' ‘What are you saying, sister?’ he replied. 'You know that I cannot stay away from the monastery.' The sky was so clear at the time, there was not a cloud in sight. "At her brother's refusal Scholastica folded her hands on the table and rested her head upon them in earnest prayer. When she looked up again, there was a sudden burst of lightning and thunder accompanied by such a downpour that Benedict and his companions were unable to set foot outside the door. By shedding a flood of tears while she prayed, this holy nun had darkened the cloudless sky with a heavy rain. The storm began as soon as her prayer was over. In fact, the two coincided so closely that the thunder was already resounding as she raised her head from the table. The very instant she ended her prayer the rain poured down. "This, of course, he could not do. He had no choice now but to stay, in spite of his unwillingness. They spent the entire night together and both of them derived great profit from the holy thoughts they exchanged about the interior life. The next morning Scholastica returned to her convent and Benedict to his monastery. "Three days later as he stood in his room looking up toward the sky, he beheld his sister's soul leaving her body and entering the heavenly court in the form of a dove. Overjoyed at her eternal glory, he gave thanks to God in hymns of praise. Then, after informing his brethren of her death, he sent some of them to bring her body to the abbey and bury it in the tomb he had prepared for himself. The bodies of these two were now to share a common resting place, just as in life their souls had always been one in God." Tell your children about the "holy twins": St. Scholastica and the tender love she had for her brother St. Benedict. Ask them how they can help one another to become saints. If you are traveling to Italy try to visit St. Benedict's Abbey of Monte Cassino. Here is a YouTube video with more pictures. If not, make a virtual visit.